"I used to worry how I would face the end. Would I go bravely, like a soldier? But let me tell you something Neo Mega. It's life itself that matters, not how it ends. Every moment is a precious gift, if only we have the courage to accept it. That's where our duty lies; not in taking life, but in living it." 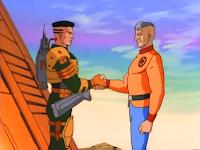 Abandon Hope, aka The Fall of the Neo Sapien Empire Part V, concludes the Liberation of Earth arc and is, surprisingly, the penultimate episode of the series. Really, you could end it here and be pretty satisfied. With the attack on the Great Slave Lake facility a failure, Winfield directs several squads of E-Frames to take Phaeton's Bunker. Inside said Bunker, Phaeton's deterioration continues. Livia betrays him, his generals are dispatched to hold an impossible position, and he waxes philosophical to Marsh while Praetorius works to repair the detonator. 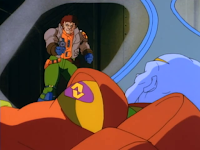 Burns and Marsala arrive seconds before Phaeton can execute Marsh (at his own insistence, a desperate delaying tactic) but Phaeton manages to fight all opposition to a draw and ooze his way to the detonator... where Nara's new mutation allows her to somehow stop him from pressing the button. She shoots him, ending the war, and around the world people rejoice. 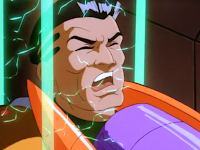 Marsh, our series protagonist, spends most of the episode in a cage, but despite this manages to connect emotionally to Phaeton and then get into a big slugfest with him at the end. A slugfest he effectively loses, by the way, as it ends with Marsh pinned and Phaeton free to move. Mostly, though, he's forced to watch the deterioration of what was once a great--evil, certainly, from Marsh's perspective, but great--man turned into a gibbering wreck. 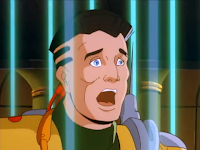 I love the emotion they wring from him as he witnesses Phaeton about to blow up the world. Phaeton, our series villain, is brought low at last. I love the visual metaphor as he emerges from his E-Frame and collapses to the ground. "I will... destroy you... I am... Phaeton!" He sounds like he's trying to convince himself as much as anyone else. Sean Napier leader of Earth's resistance, uses his armored column to spring a bunch of Neo officers whom Phaeton has ordered executed. He's come a long way from a man who wouldn't shake one of their hands. Nara Burns, J.T. 's number two, has rather a different evolution. She fears that she's losing her humanity, and with good cause. Phaeton, of all people, even calls her on it. Despite this, she remembers her roots, shooting him (with Praetorius' gun, which is delightfully ironic considering that he was literally the only normal Neo Sapien personally loyal to him in the end) in the name of her brother. 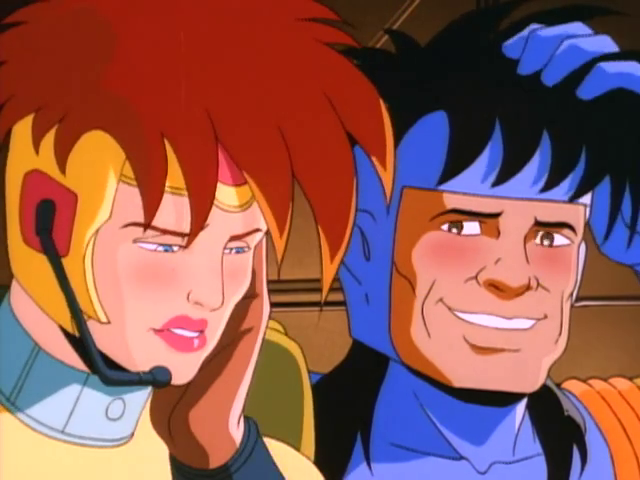 Wolf Bronsky and Eve Hanley's relationship is acknowledged. He comes in with the uninjured Jump Troopers and saves the day, catching Shiva from behind after he's outflanked the invaders. He also realizes what victory means, and is quick to go out and "make some noise." This also ties in nicely to the ringing of bells motif that started with Fifth Column and continued by Phaeton's flashback this episode. 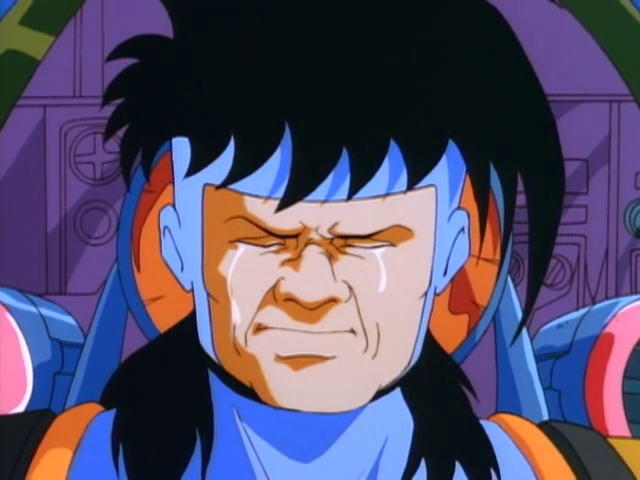 Shiva is closer to his old self this episode. Phaeton asks if he can stop the incursion into the bunker and he is blunt. "No. But I will try." In defeat, he asks Bronsky to shoot him, claiming he has no desire to live, but Bronsky refuses. Draconis isn't quite so lucky, killed by Rita Torres' battering ram fist. This is the only of Algernon's superpowers to be used in the episode, btw. It's also Torres' one big contribution to the plot, though she doesn't have any lines. 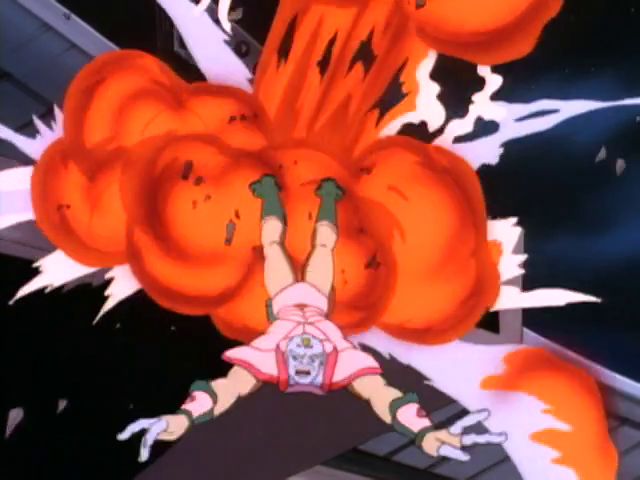 Typhonus, too, perishes attempting to carry out Phaeton's orders, blown up by the Resistance seconds before he could carry out the execution of the purged Neo Sapien officers. 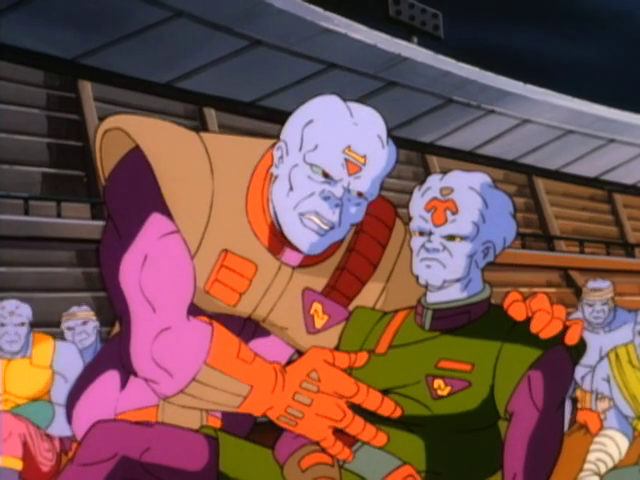 Thrax and Galba are among said officers, and give the quote for the episode. Galba, tellingly, wishes that he had perished with the rest of his brood. It's a surprising little bit of humanity from one of the custom-made Neo geniuses. Takagi has a moment to morn Stavrogan, and as Marsala's second chair manages to take out some Neo Lords with a bank shot. Marsala and Weston don't have a ton to do, though they each get a moment or two. Weston gets embarrassed for speaking during a meeting, then gets taken out by Shiva's flank. Marsala observes that Phaeton's lack of imagination makes it likely that his command center will follow the contours of the old subway grid, and even engages Phaeton before getting taken out by a Neo Lord. The Jump Troopers! O'Reilly fixes the shuttle and gets the team back to Chicago. I love the bombardment evident as the shuttle arrives. Pelligrino gets to read the Dante on the door, allowing Bronsky to shoot out part of the sign to change the message's meaning. Also, this shot of him tells you pretty much everything you need to know about the character. Longfeather stays behind with the wounded at Gettysburg. "We can hold this ridge. It's been done before." Livia gets to die, executed by Neo Lords for daring to sabotage the Doomsday Device. There's one visual exchange that sums up everything you need to know about her mindstate. Draconis good-naturedly tells Shiva that he'll be showing him up in battle, and Phaeton looks on delighted, even as the walls rattle from an orbital bombardment and Phaeton is preparing to destroy the world and 99% of all Neo Sapiens left in creation. She seems to be the only one who appreciates the absurdity, collapsing into herself. Praetorius makes his last appearance as well. 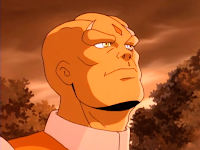 I'm half surprised Phaeton didn't name him commanding general of Earth, but I suppose even he would see that as bad comedy given how little of Earth was under their control. He goes down swinging, though, a true believer till the end. And finally, Admiral Winfield. He gives the briefing, then lets his men do their thing. It's enough, and the episode ends with him landing on Earth for the first time to claim victory. Aside from character endings, the episode does manage to do a few things very nicely. 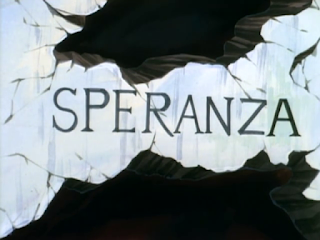 Shooting up the sign over Phaeton's bunker leaves "speranza," or "hope." It's the last image in the episode, too, appropriately enough. As Marsala flies back to the Resolute 2 with Takagi in the back, the series takes a moment to remember some of the casualties along the way. It's a nice moment, and reminds us of what it's cost to bring us to this point. Phaeton shares with marsh a moment when he was at peace. He casts his mind back to a lecture he gave at the University of Chicago. The weather was perfect, and bells were ringing. (See what they did there?) It's very late in the game to further humanize our villain, but it's a nice beat that not only sets up the bells but helps establish how Phaeton's mind is starting to drift. It only makes his ranting and lunacy that much scarier when he turns it back on. The Neo officers certainly look pathetic, don't they? Once again, the series does not shy away from disturbing imagery. 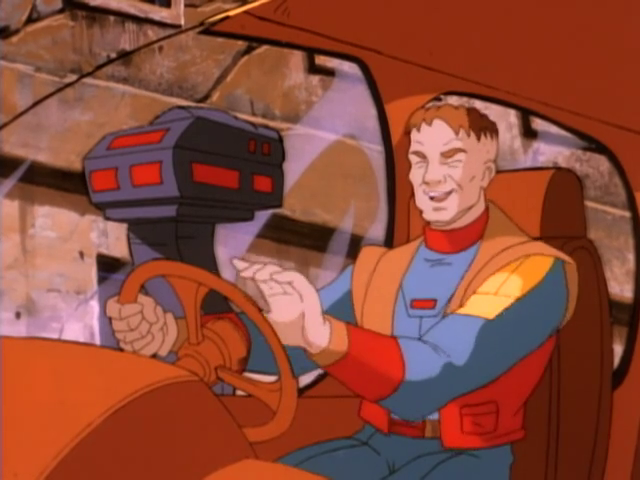 There are numerous ties to earlier episodes. Many I've noted, but one in particular stood out to me. 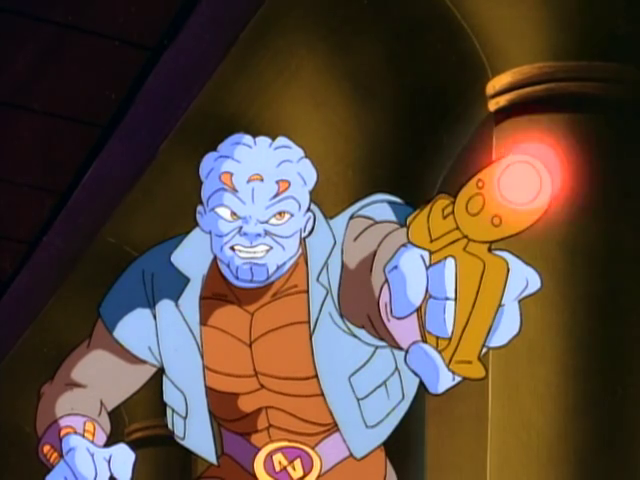 Phaeton calls his imminent use of the Doomsday Device "the most important event in the history of the solar system." 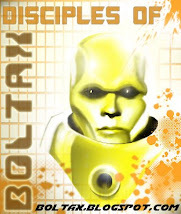 Those are almost the exact same words he used to describe the Neo Sapien ascendancy way back in episode 4, Blitzkrieg!. What Doesn't: There's a scene where Takagi and Weston whisper to each other during a briefing, prompting a throat-clear from Winfield. This produces guffaws from the assembled pilots far out of proportion to the incident. I realize that this is drawing a connection to a similar scene in the first episode, but it goes on for far too long and undercuts the seriousness of the mission briefing. Chalk it up to too much tension? I do like the one guy right in the middle who refuses to laugh. Marsh's fight with Phaeton is brief and not as powerful as the season 1 finale. The stakes are higher, but they somehow don't feel higher. Sure, I get why having our protagonists duel makes sense, but the ending already subverts expectations enough that you could probably have cut this beat and had it still work. 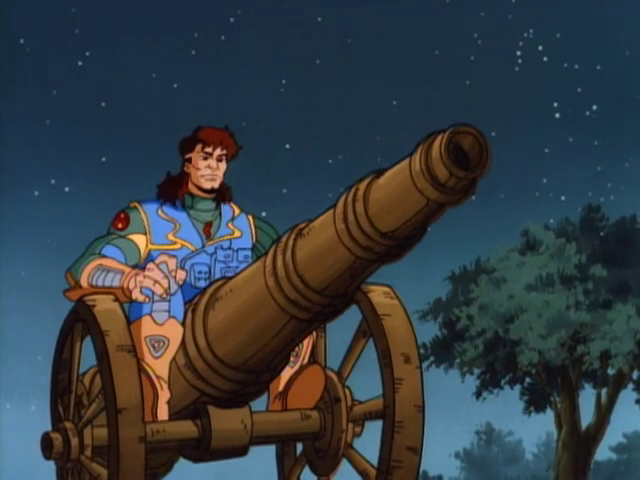 I almost think the series missed a trick by allowing Marsh to get to this point, rather than just having Phaeton shoot him at his own request. It's also odd that we see Shiva put a fusion pack in Marsh's frame. Yes, that does deal with the fact that he lost it last episode, but it doesn't address WHY they rearmed the war machine. Taunting him with its nearness, perhaps? I think you'd need a line to that effect. Perhaps if he'd grabbed a fusion pack from one of the downed mechs, or somehow taken Hanley's frame (which probably used to be his, way back when) it would have worked better. Watch For: New Soldier Field makes another appearance, as the holding area for the "disloyal" Neo Sapien senior officers. It gets attacked by the resistance, allowing the "traitors" to flee. 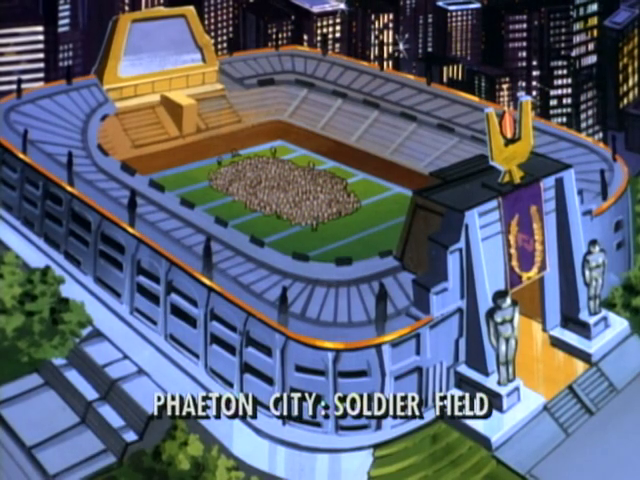 This isn't the first time New Soldier Field would be full of traitors and get attacked by the resistance. 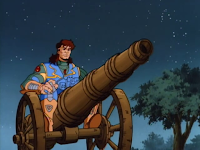 Draconis is back in his heavy, S1 E-Frame. During the montage of celebrations from around the world, we see several familiar faces. Our surviving Australian cast share a quiet campfire together. Sidney in New York adds his horn to the revelry. Bio: Algernon, not even in the episode. Overall: Great episode. 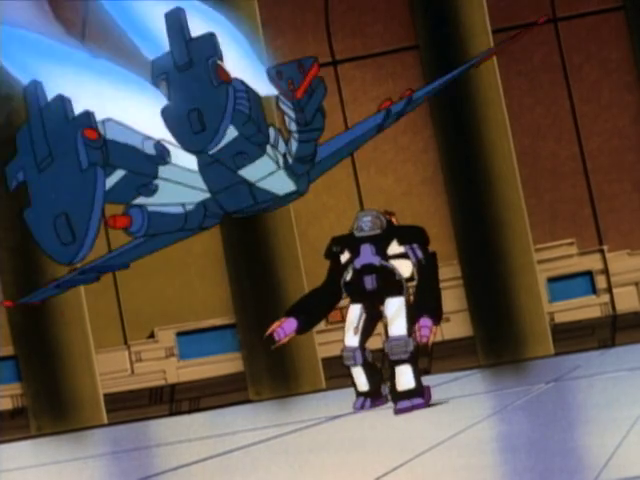 Ties into everything that's gone before, all the way back to the first episode, and especially does a good job at tying up the loose threads of Able Squad, Thrax, the Jump Troopers, the Resistance, and the Neo Sapien high command. If the series ended here, it'd already be a classic. That they decided to do one more episode to show us the aftermath only makes THIS episode even stronger. The use of the Doomsday Device is also exceedingly clever. Most wars don't end on a coin-toss. There're often knife's edge moments, but they're usually somewhere in the middle. This war is no exception. I would argue that the destruction of Mars was what really sealed Exo-Fleet's eventual victory (a weakness of the series, truth be told, since that came about as an intervention from an outside force), though you could also point to Shiva's assault on Venus. By the time we're liberating Earth, Phaeton has lost the war. It's only a question of when and how. 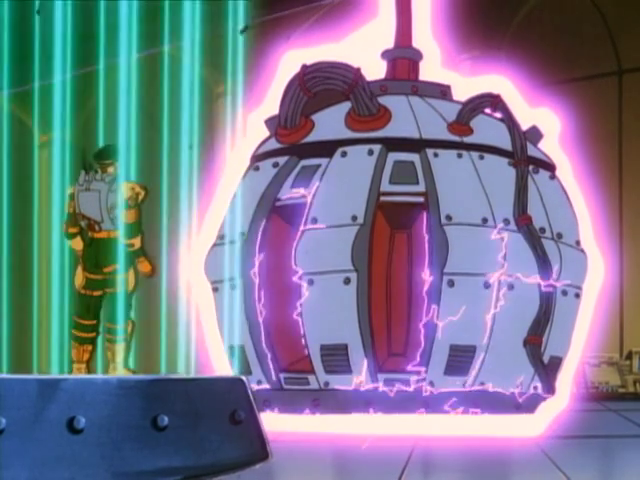 But by introducing the Doomsday Device, the series manages to realistically portray the Exo-Fleet's advantage while still keeping the stakes high. Yes, if Phaeton blows up Earth, in many ways, the Exo-Fleet "wins." There are no more Neo Sapiens, and they control Venus and the outer planets. But oh, my, it'd be the most Phyrric victory in history. I list it here, in the conclusion, because it's not so much a strength of this episode, but of the Liberation of Earth arc and indeed the series as a whole. In many ways, a series is only as strong as its ending. The Sarah Conner Chronicles was a great series, but its wide-open ending that resolves nothing makes me hesitant to recommend it to anyone. 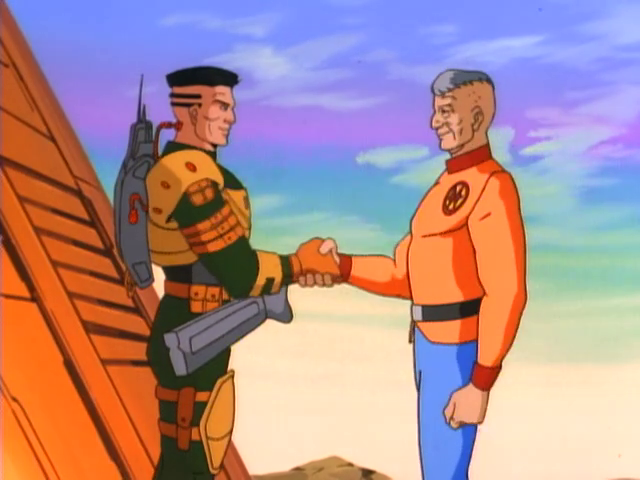 Exo-Squad, by setting up the Neo Sapien threat and then resolving it so effectively, seals the deal for this show. AND we still have one more! Can't wait to see what they do with it.